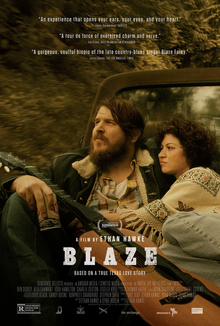 Blaze is a 2018 American biographical drama film directed by Ethan Hawke based on the life of country musician Blaze Foley. The screenplay by Hawke and Sybil Rosen was adapted from the novel Living in the Woods in a Tree: Remembering Blaze by Rosen. It stars musician Ben Dickey as Foley. The film premiered at the 2018 Sundance Film Festival and was released in the United States on August 17, 2018, by IFC Films. Principal photography took place in and around Village Studios in East Feliciana Louisiana and a small amount of photography in Mississippi in early 2017. On review aggregator website Rotten Tomatoes, the film holds an approval rating of 95% based on 79 reviews, and an average rating of 7.8/10. On Metacritic, the film has a weighted average score of 75 out of 100, based on 29 critics, indicating "generally favorable reviews". On RogerEbert.com, Nick Allen raved that the film is "hands down the best movie of its kind since Inside Llewyn Davis" and added "This movie is all Foley, and the confidence in his words proves incredibly rewarding for Hawke as a cinematic storyteller himself." ^ "'18 Sundance Film Festival - U.S. Dramatic Films". www.sundance.org. Retrieved February 7, 2018. ^ "Blaze (2018)". Box Office Mojo. Retrieved September 5, 2018. ^ a b Galuppo, Mia (February 10, 2017). "Richard Linklater, Kris Kristofferson Joining Ethan Hawke's Music Biopic 'Blaze'". The Hollywood Reporter. Retrieved March 22, 2017. ^ Fleming Jr, Mike (January 18, 2017). "Ethan Hawke Helming C&W Tale 'Blaze' With Newcomer Ben Dickey". Deadline Hollywood. Retrieved March 22, 2017. ^ Debruge, Peter (November 29, 2017). "Sundance Film Festival Unveils Full 2018 Features Lineup". Variety. Retrieved November 29, 2017. ^ "Blaze (2018)". Rotten Tomatoes. Fandango Media. Retrieved August 19, 2018. ^ "Blaze reviews". Metacritic. Retrieved August 19, 2018. ^ Allen, Nick. "Sundance 2018: Blaze". RogerEbert.com.